Meteorite impacts and geological formations: So far, exploration of Mars has focused on its surface. The "InSight" mission of NASA and European partners starting on May 5, 2018 will now concentrate on the "inner values" of the red planet: How big is its core? Is it liquid like the Earth's outer core or solid like the Earth's inner core? How thick is the crust? 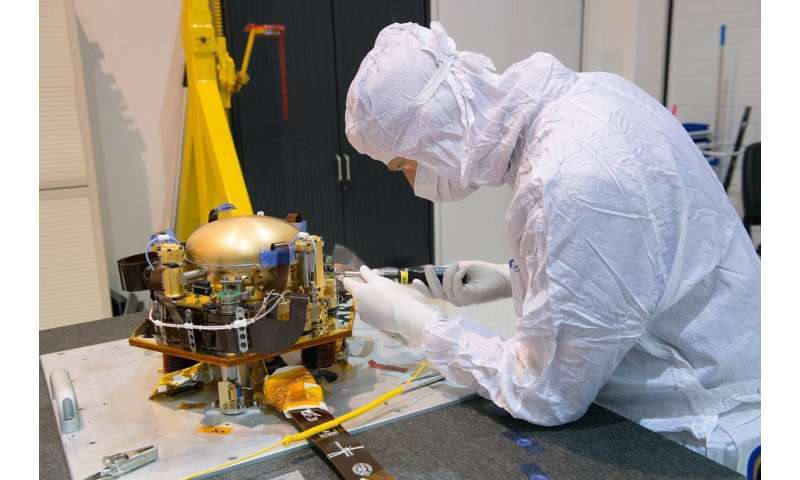 To study the structure of Mars, NASA, among others, uses the highly sensitive instrument package SEIS with six seismometers. The qualifying model or "sister device" of one of the seismometers is currently being tested at the Joint Geoscientific Observatory (Black Forest Observatory, BFO) in Schiltach, which is operated jointly by Karlsruhe Institute of Technology (KIT) and Stuttgart University. To illuminate the structure of Mars, scientists plan to record Mars quakes using the SEIS instrument package during the InSight mission. The package contains six seismometers, three short-period seismometers suited for frequencies of up to 100 Hz and three broadband seismometers for frequencies of up to 10 Hz. 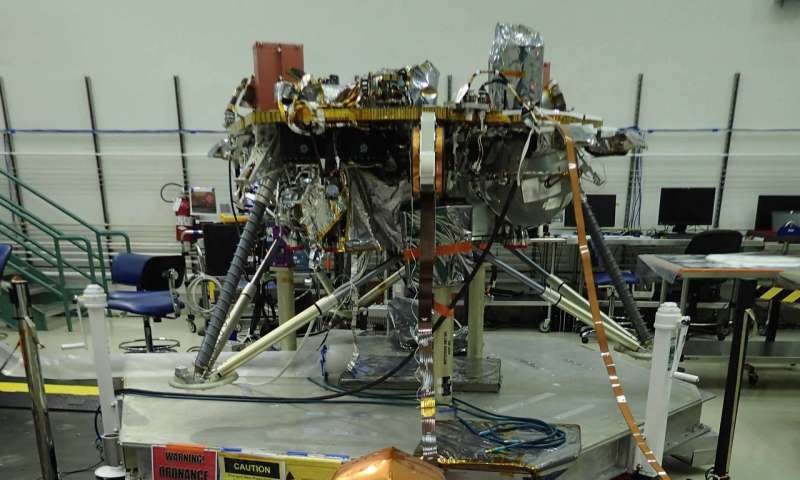 "Using a set of [Textfeld: Seismometer (foreground) and InSight Lander (background). (Photo: Copyright CNES)] three systems, ground movement in vertical and two horizontal directions can be measured," Rudolf Widmer-Schnidrig of BFO says. The Mars seismometers were developed in high-tech clean-room laboratories by engineers in Toulouse, France, and Pasadena, USA, At the joint observatory of KIT and Stuttgart University, the instruments are now characterized under optimal terrestrial conditions. The current second test focuses on the performance of one of the broadband seismometers after two short-period seismometers were tested at BFO a year ago. "At the BFO, we have excellent measurement conditions. Seismic noise is low. The seismometers operated supply data with the lowest noise worldwide," Widmer-Schnidrig says. Moreover, the BFO is one of the few seismological observatories, where scientists and technicians work onsite. "During tests of instruments we can provide support anytime, which is not possible at other seismic stations." The tunnel system of the former ore mine in Schiltach in the Black Forest is located in granite. The inner part of the tunnel accommodating the measurement chambers for the instruments is isolated from the outer world by two pressure locks. This part of the tunnel is located about 150 m below the Earth's surface. As a result, the instruments are shielded from impacts of direct air pressure or temperature fluctuations and they are located more than 5 km away from anthropogenic sources of interference (industry, transport). This makes the BFO an extraordinarily calm measurement location. The InSight Mars mission planned by NASA and European partners in 2018 is aimed at studying geophysical properties of the "red planet." In addition, fundamental questions relating to the planetary and solar system shall be answered to better understand the history of creation of planets of the inner solar system, one of which is the Earth. Similar to quakes on Earth and on the Moon, it is expected that there are also quakes on our neighboring planet Mars. In terms of size, Mars ranges between the Moon and the Earth. A highly sensitive seismometer (SEIS) is to observe the Mars quakes and, hence, represents a central instrument of the "InSight" (Interior Exploration using Seismic Investigations, Geodesy and Heat Transport) mission. From the recordings, conclusions shall be drawn with respect to the structure of Mars, the size of its core, the thickness of its crust, and on whether its core is liquid.